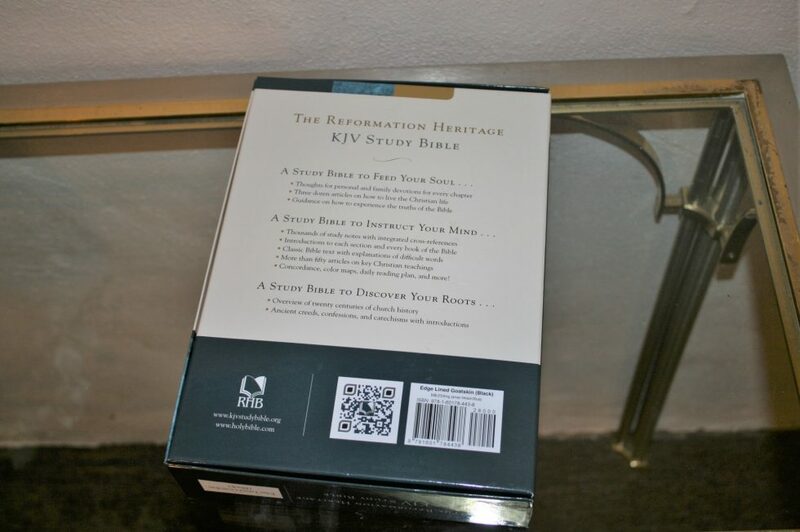 The Reformation Heritage KJV Study Bible is a study Bible that focuses on key doctrinal information from the Puritan/Reformed point of view. The layout is a modern design that separates the text from the study material beautifully. 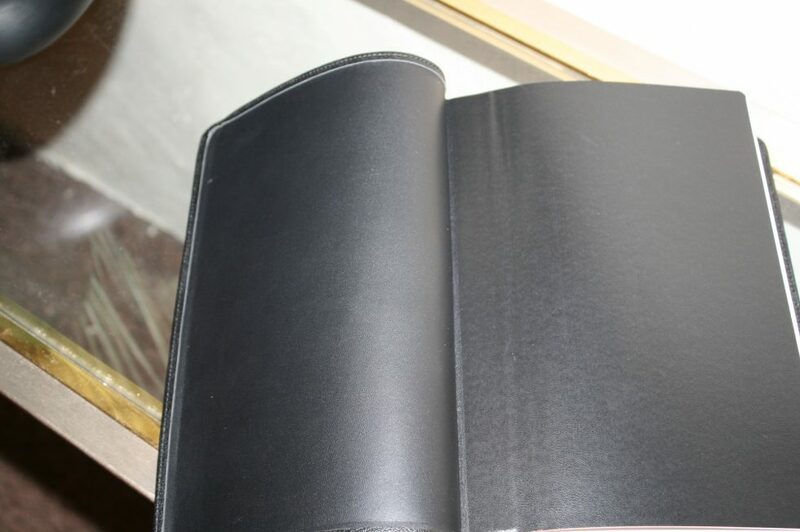 The edition I’m reviewing was produced by Jongbloed, with goatskin leather and elegant paper. 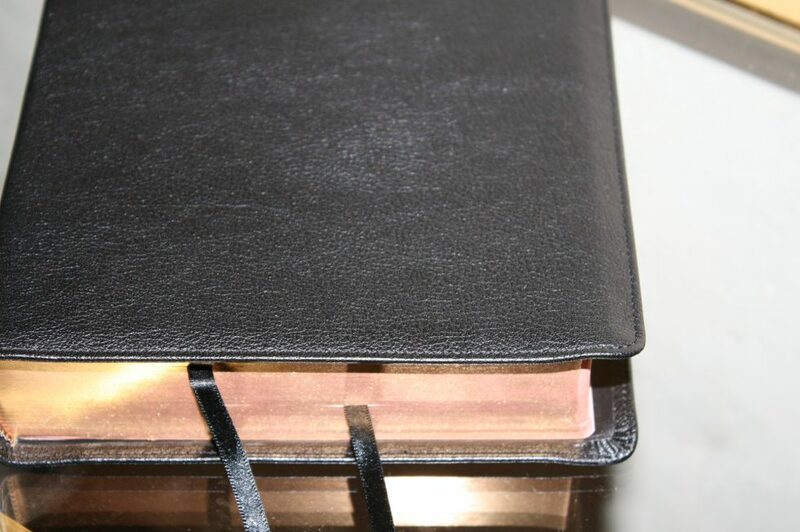 The cover is black goatskin with an edge-lined leather liner. The grain has a natural pebbly texture and is extremely flexible yet not so flexible that it’s difficult to handle. 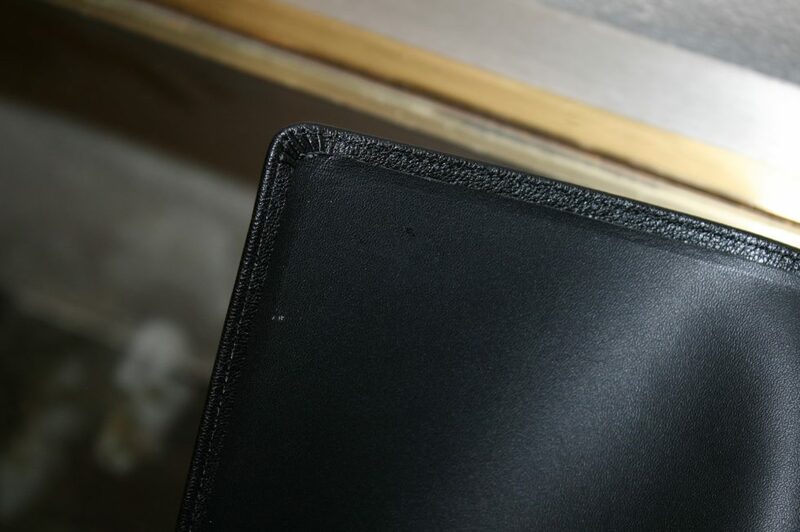 The cover has a little bit of a yapp and is perimeter stitched. 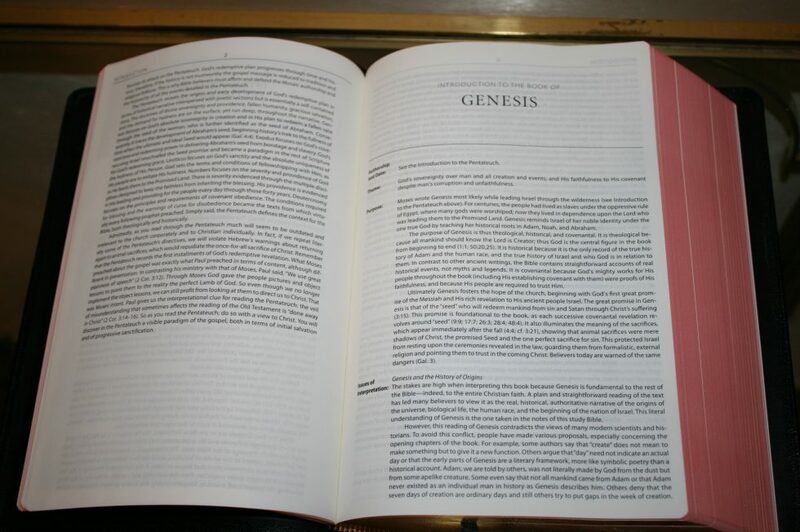 The tab in the edge lining feels stiff but the pages still lay open and flat in Genesis. The binding is Smyth sewn. There are no spine ribs but it does have gold stamped onto the spine for a design. 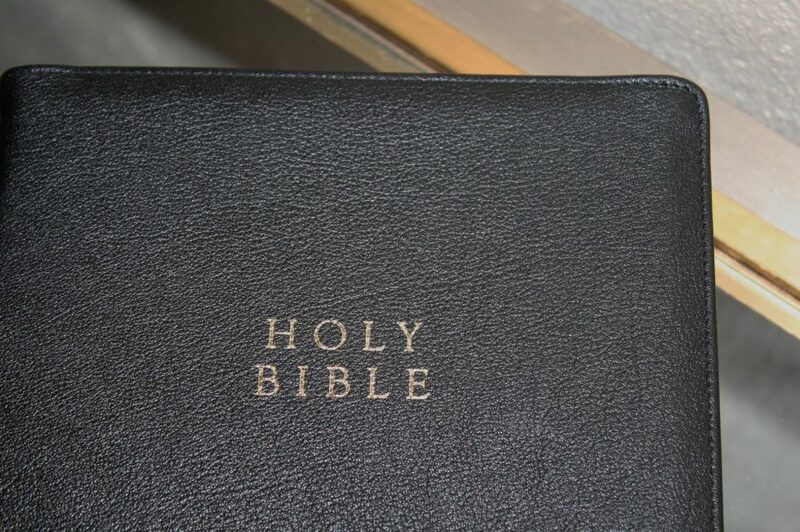 The spine shows the Bible’s name and the RHB logo. 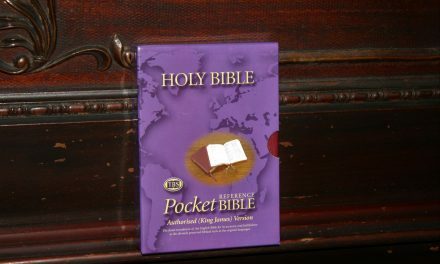 The cover shows Holy Bible on the front. 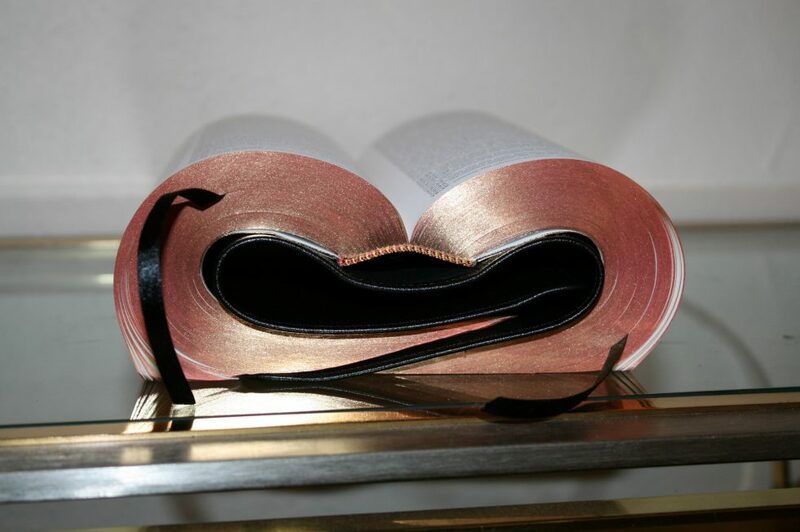 The two ribbons are basic, like those found in Cambridge editions. 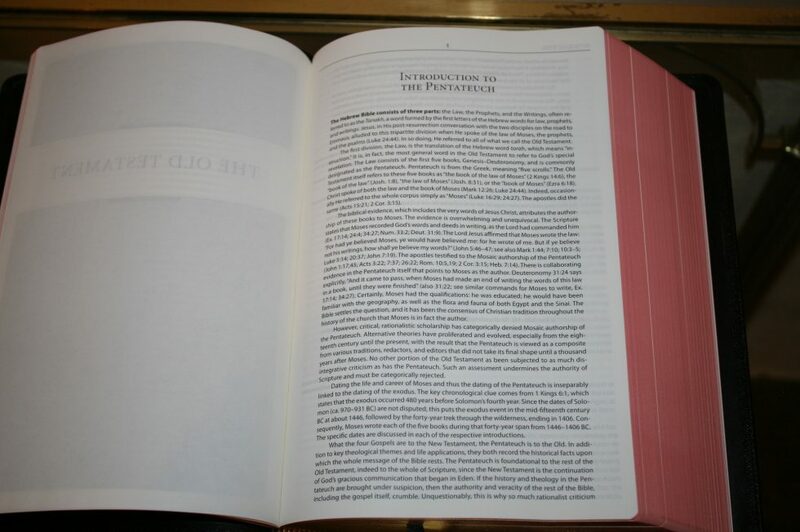 The textblock and spine are square. 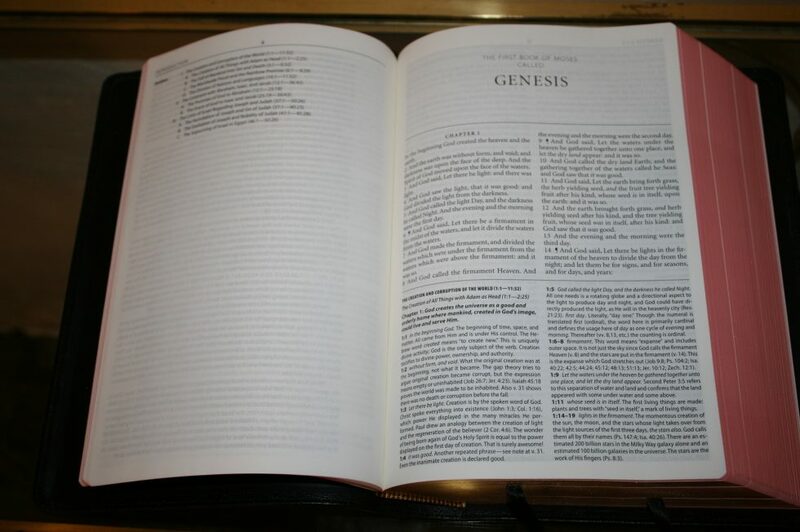 The Bible is wrapped with high quality paper in the clamshell box. The paper seems to be 28-30gsm and has that cream color that I love. It’s highly opaque and looks and feels elegant. It’s great for reading for long periods of time. I had no issues turning the pages. I haven’t tried writing in it. The edges are art-gilt using a darker red than most publishers use. 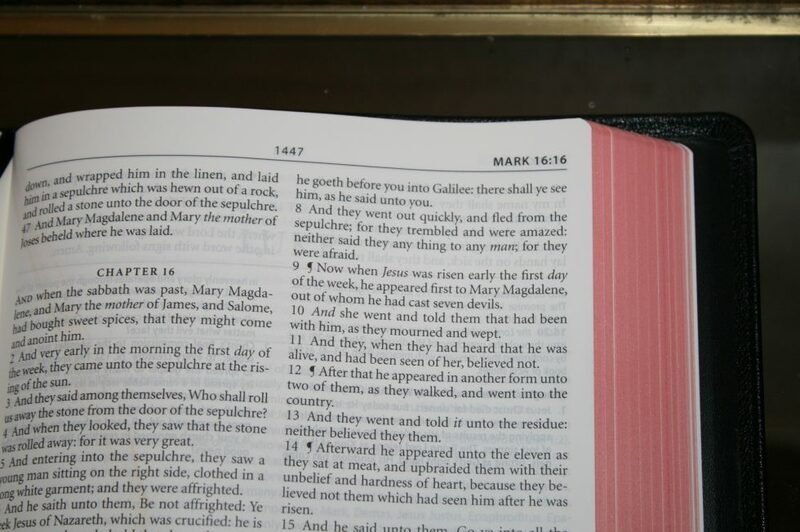 The layout follows the modern trend, and my preferred design, for study Bibles – a text with no references within the text’s area and a clean text with no distractions. 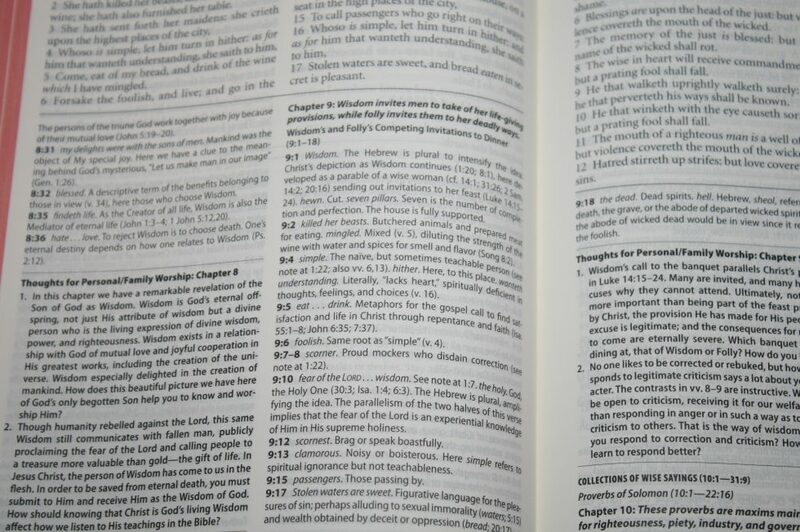 The references are placed within the study notes under the text. 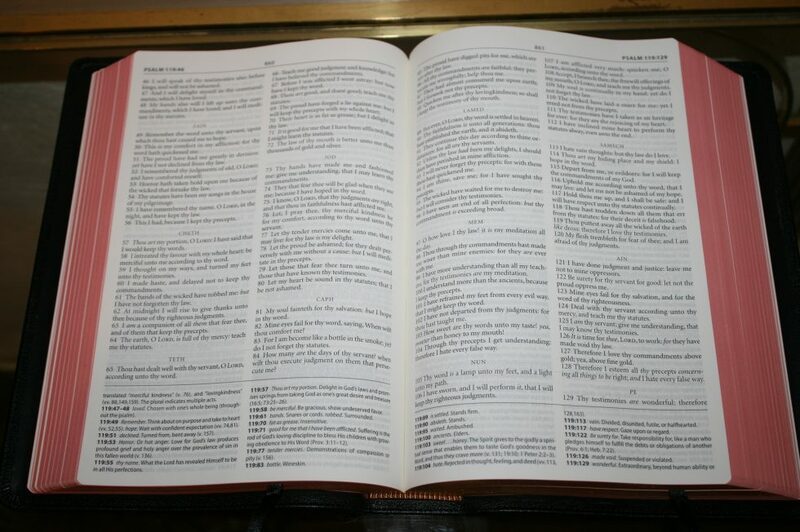 The text is presented in double column, verse-by-verse format. The black letter is 9.8 point Minion font and is consistently dark throughout the Bible. 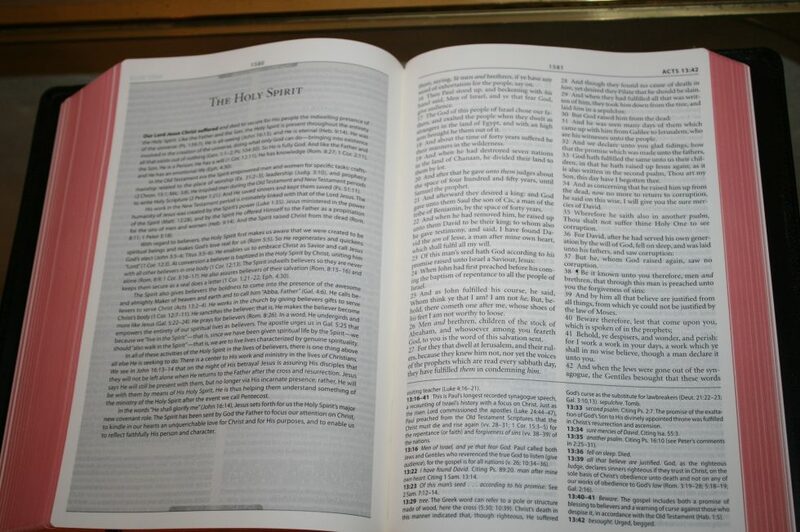 The text is printed with line-matching and is easy to read. The notes are 8 point Myriad semi-condensed font. The typeface is easy to read and I love the font and print quality. It’s not an overly dark font but the color and opacity of the paper make it stand out. There are no pronunciation marks or reference keys within the text, keeping the text clean. It does have italics for supplied words. 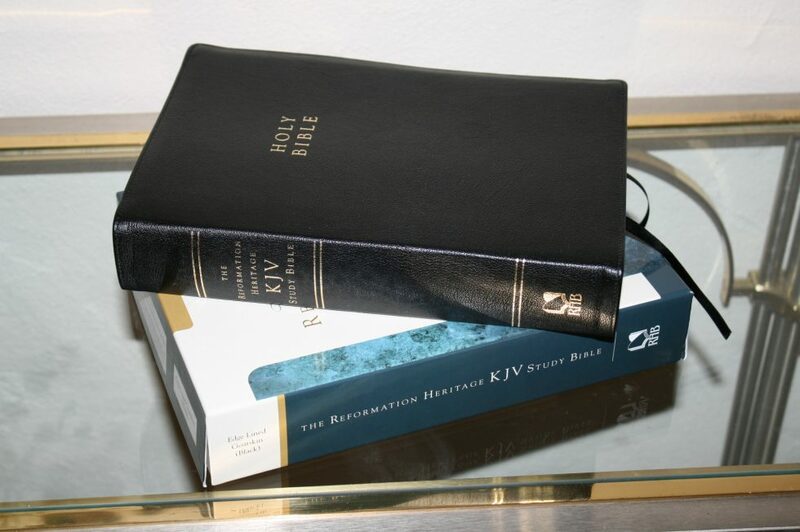 I’m glad these were left in because in my opinion that’s one of the advantages of the KJV. Columns are 2 5/8” wide with 46 characters across. This gives around 10 words per line with generous room between the words and between the lines. The inner margin is large at ½”. It brings the text out of the bend of the gutter. 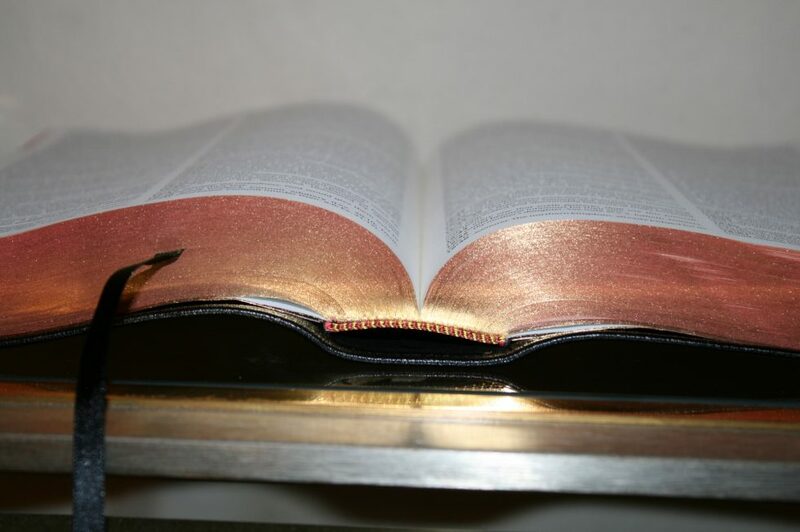 The outer margin is ¼” which is small for the size of this Bible. It isn’t large enough to use for small notes or symbols. 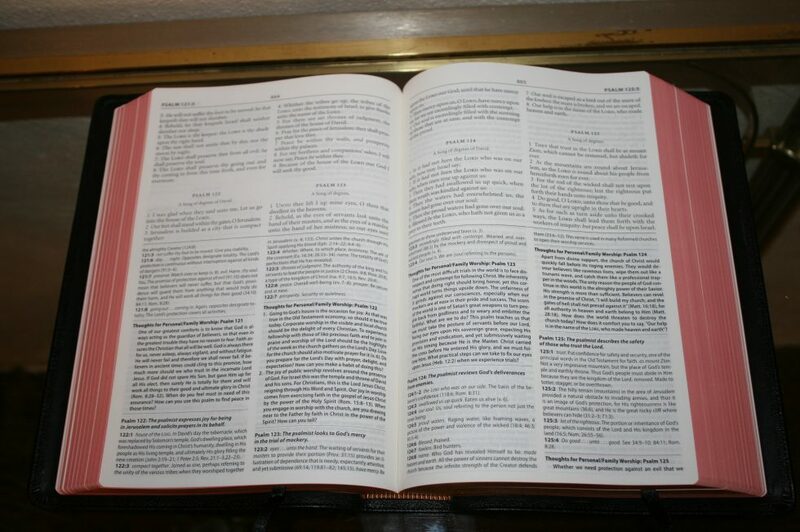 Each chapter shows Chapter # in an all-caps bold font at the beginning and then the first verse starts on a new line without showing the verse number (Psalms shows the verse number). This makes the chapters stand apart in a clean and unique way. There are no section headings within the text. 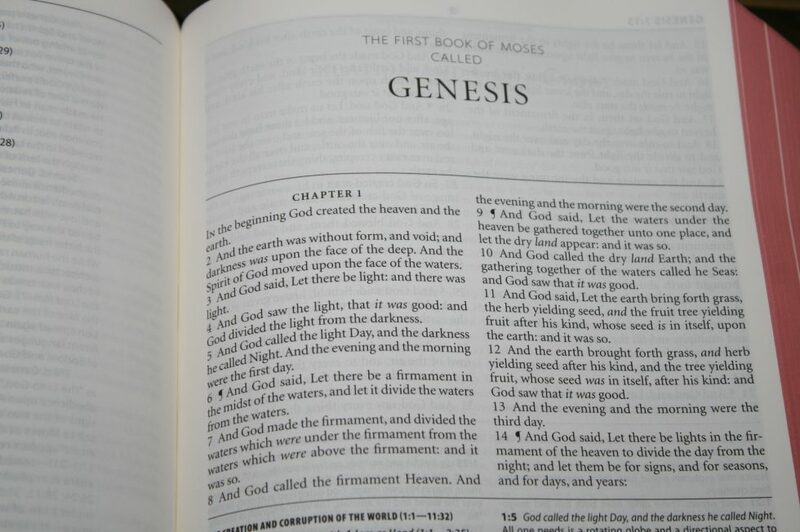 The header shows the book name and chapter and verse numbers over the outer margin and page numbers over the center of the page. The various sections are separated by horizontal lines. This even includes various sections within the study notes. References are placed within the study notes and are not keyed to the text. 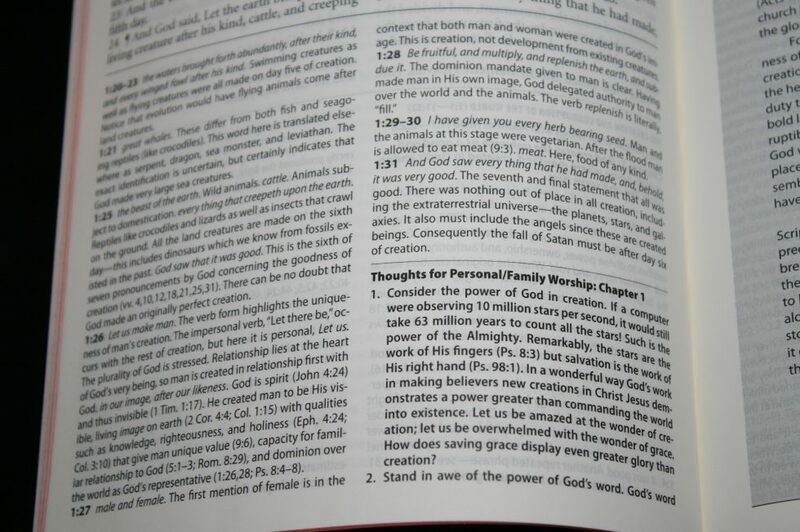 They’re given within the context of the study notes so you’ll know what portion of the text they correspond to. They sometimes show the same reference multiple times within the notes because of making multiple points. 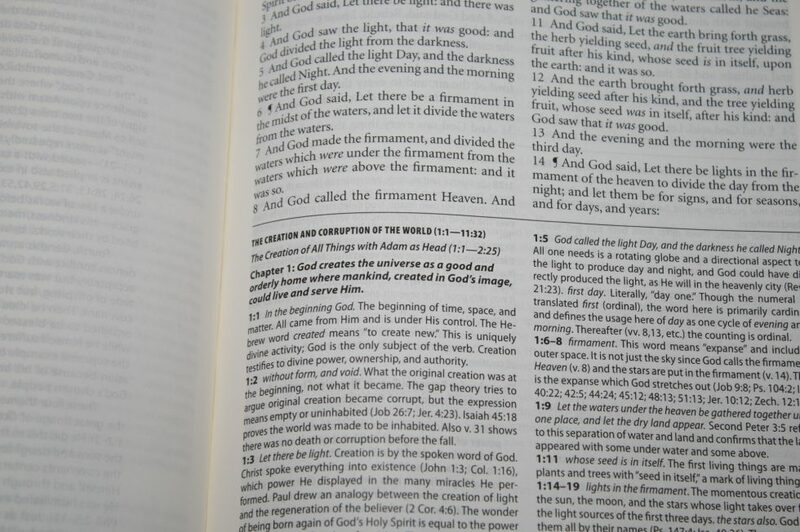 There are multiple places where a verse is discussed, so if there aren’t any references given within the study notes they might be given within the book introductions, articles, or even in other verses. 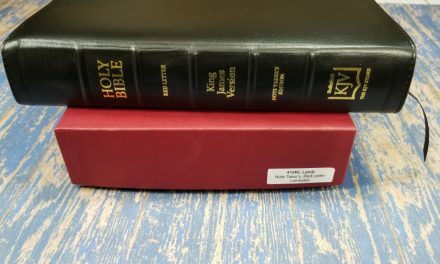 There is an introduction to each major section and each book of the Bible, starting with an extensive introduction to the King James Version itself. Section introductions take a couple of pages and discuss the kind of writing, setting, etc. These help provide insights on interpretation and application. Book introductions discuss the author, date, theme, purpose of the book, issues with interpretation, and then give a synopsis and outline. They take around 4 pages and provide a good understanding of the book to help in study. 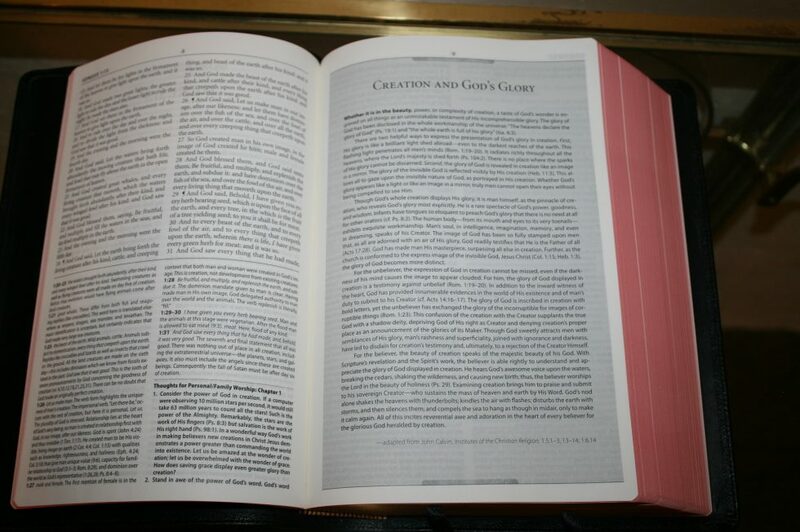 There are over 50 one-page doctrinal articles throughout the text. They stand out because they’re printed over a gray background. 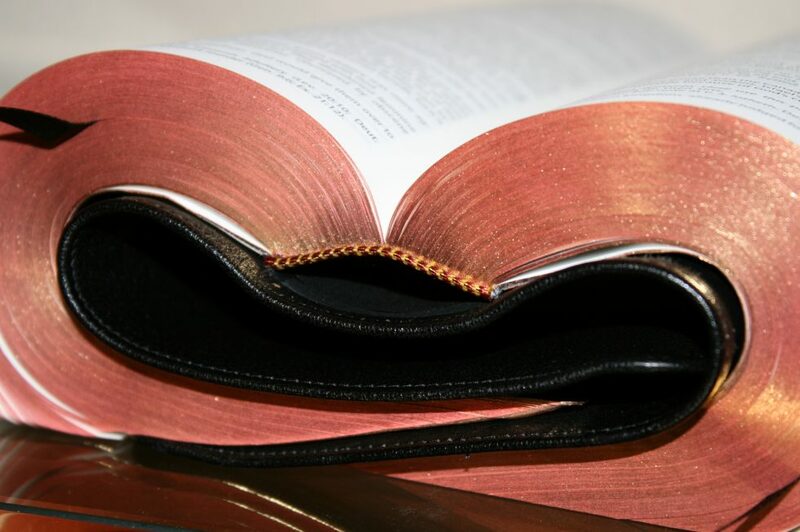 They cover basic Christian concepts from the reformed point of view. 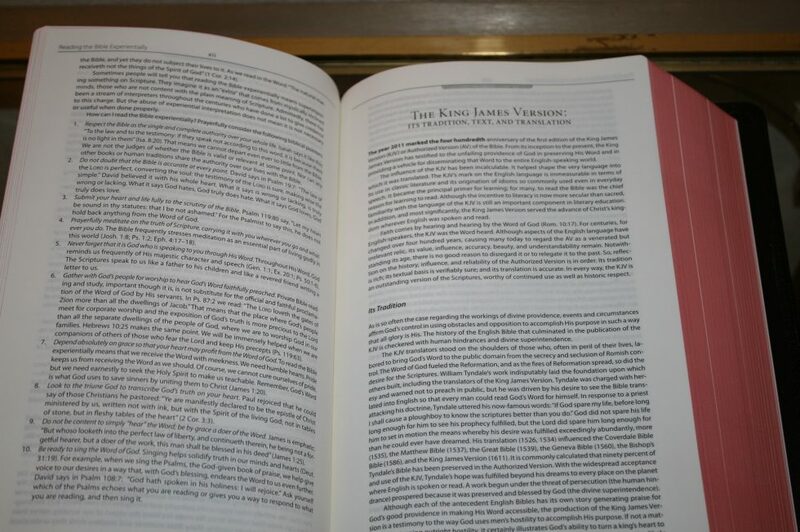 A few of the articles are adapted from writings of writers such as John Calvin. 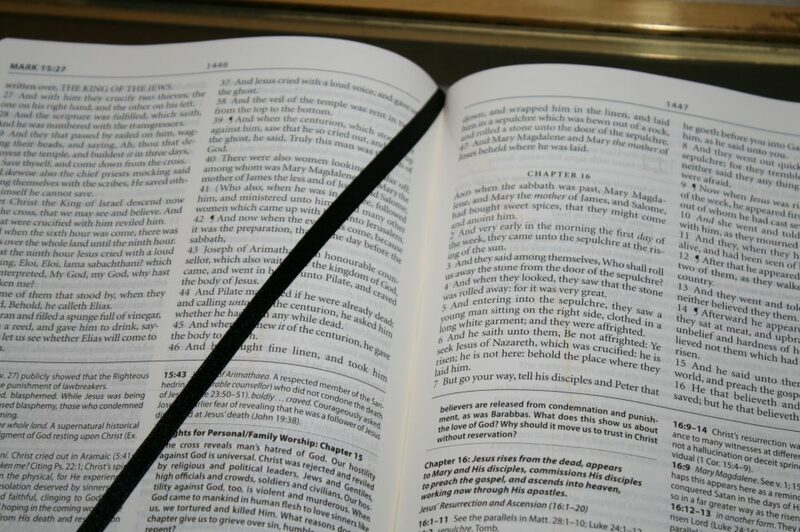 The study notes includes several types of notes including word studies, commentary, headings, chapter summaries, and short devotionals. 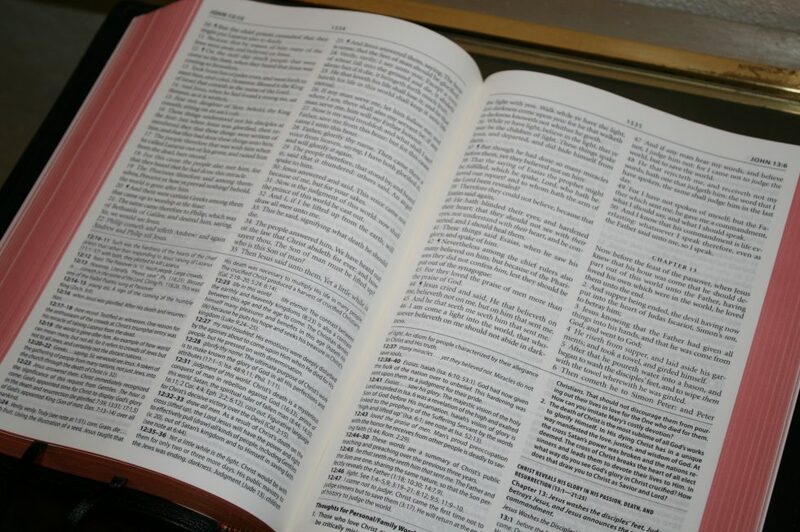 The words studies explain the meanings of words and phrases. 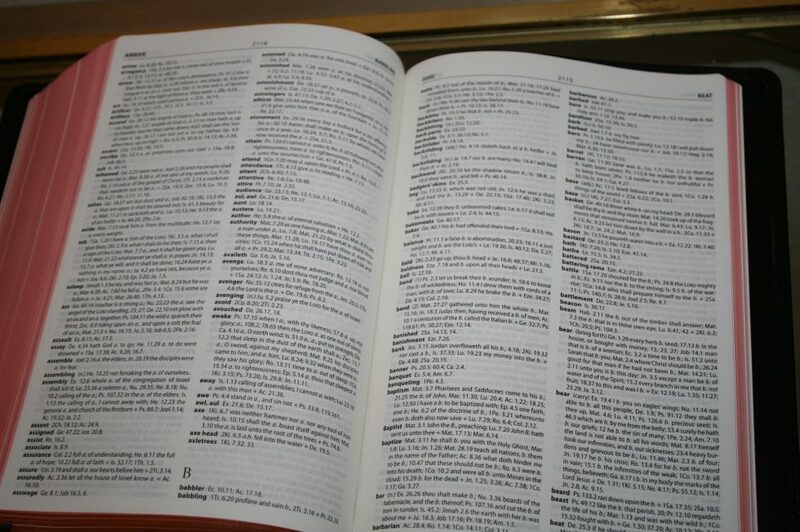 It gives the modern equivalent of words that have changed meaning or are no longer in use. 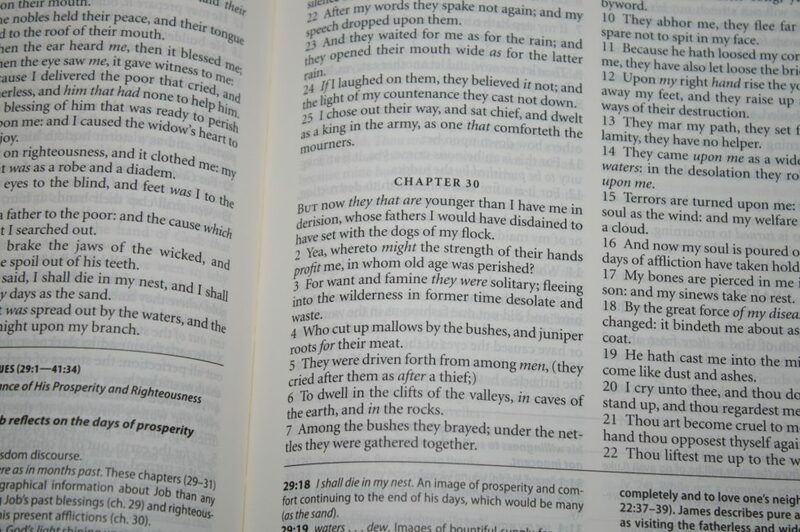 I’m glad this is included as it helps improve the readability (and reader’s comprehension) of the KJV. 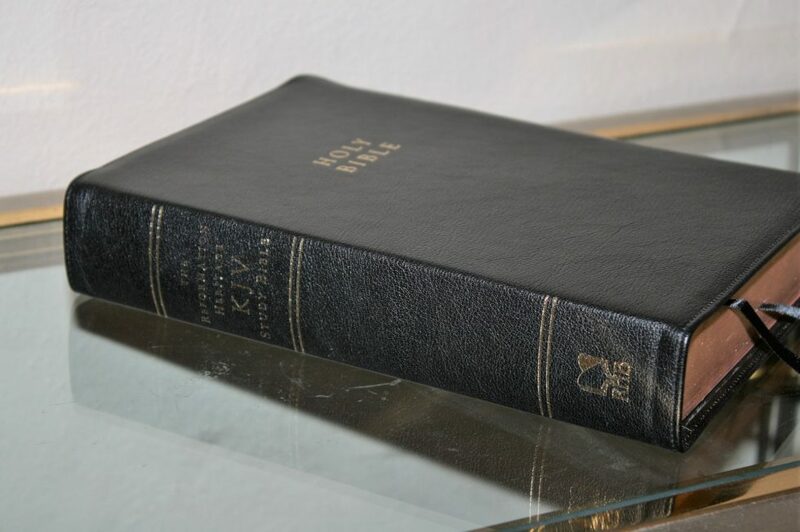 I’ve read the KJV for over 30 years and I’m still amazed when I see a word that I thought I knew what it meant. 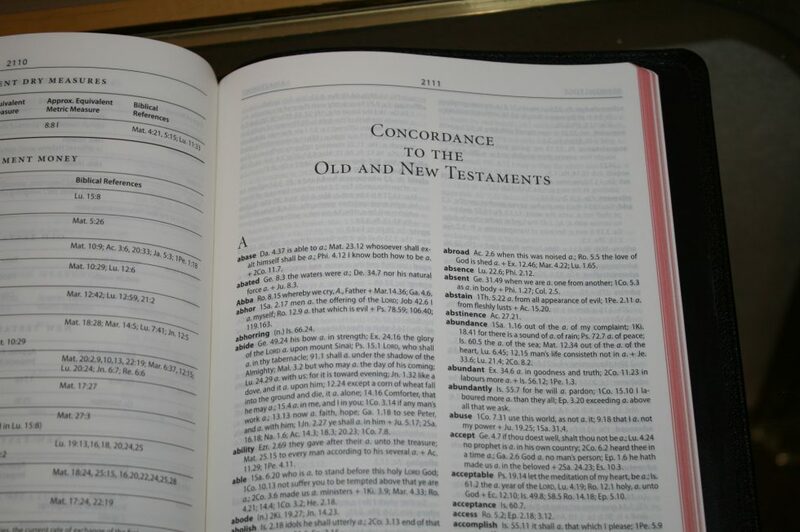 The doctrinal commentary in the notes are based on reformed theology. 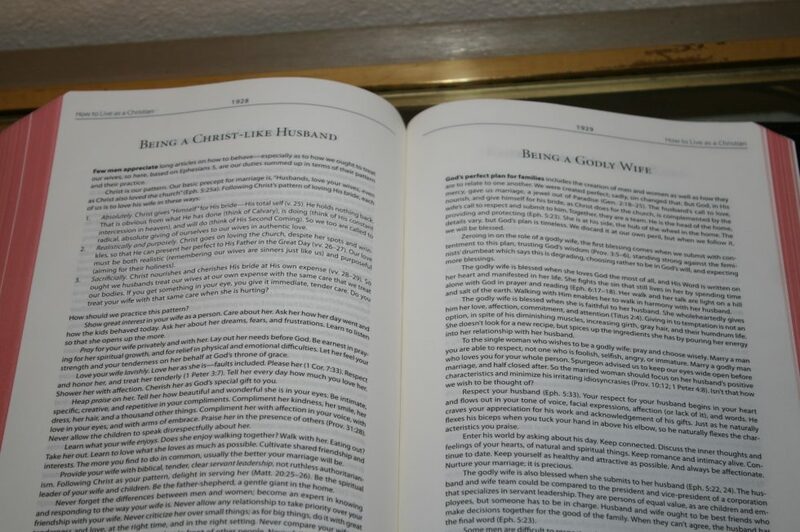 Chapter summaries and section headings are placed in the study notes area and printed in bold. 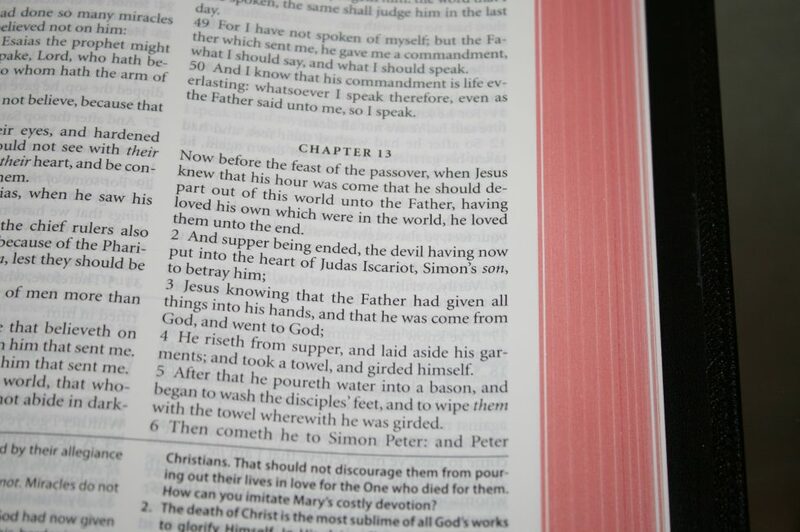 The section headings include the verses they correspond to. This keeps them out of the text, making the text distraction-free, but still gives you access to them. They’re helpful for searching the page and getting an idea of what’s taking place. They’re not as useful at the bottom of the page but I prefer this because it keeps the text clean. 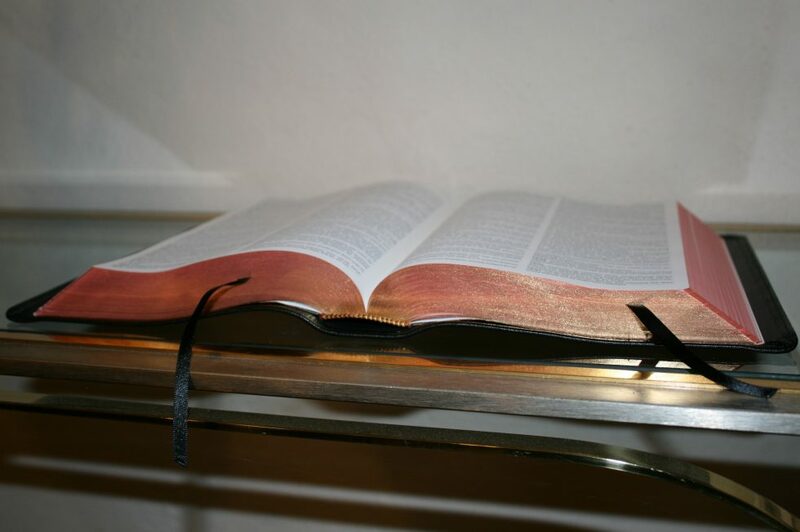 There are small devotionals called Thoughts for Personal/Family Worship that take points from the chapter and give an application for worship. 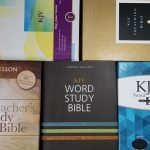 These help with digging into God’s Word rather than just reading it. 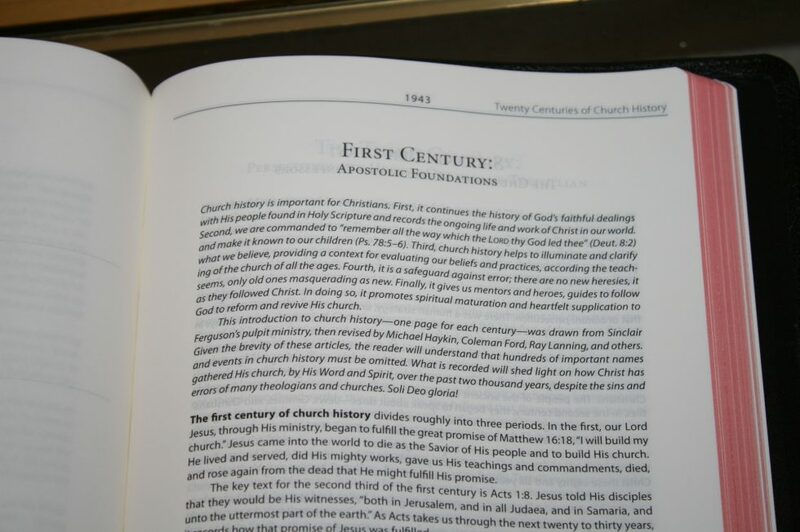 This is an overview of Church history through the centuries from Sinclair Ferguson’s pulpit ministry and revised by various writers. 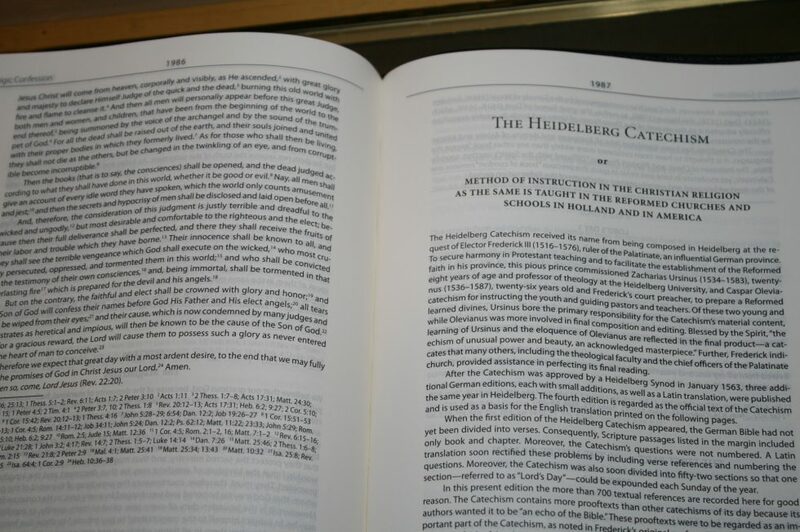 It has one page per century and mostly gives a summary of the popular views of the time and the development of key doctrines and creeds. 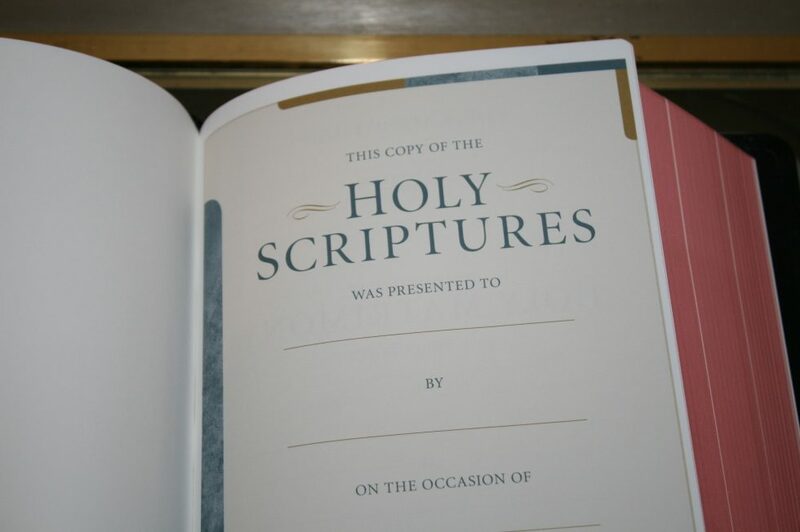 The 9 major creeds and confessions are included. 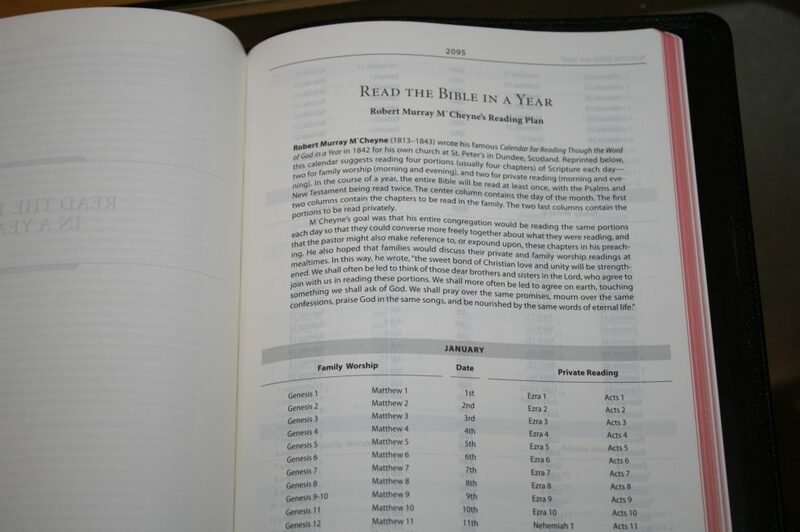 The M’Cheyne reading plan gives 4 readings per day. 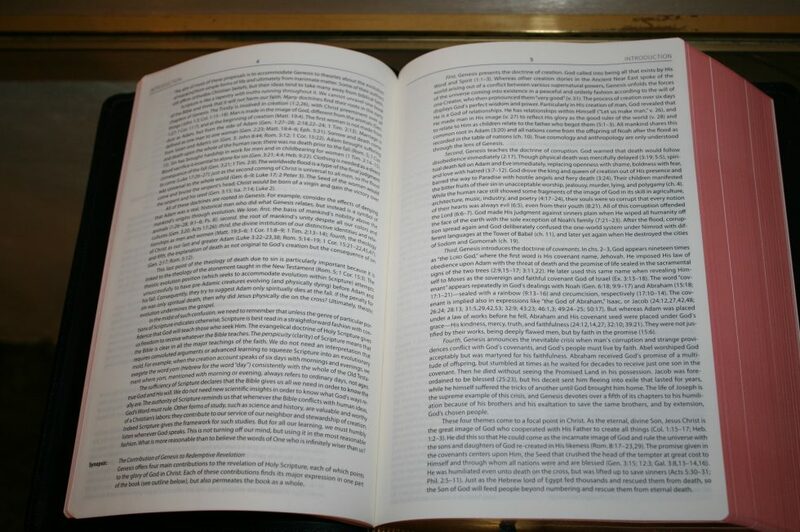 This takes you through the entire Bible once and the New Testament and Psalms twice. 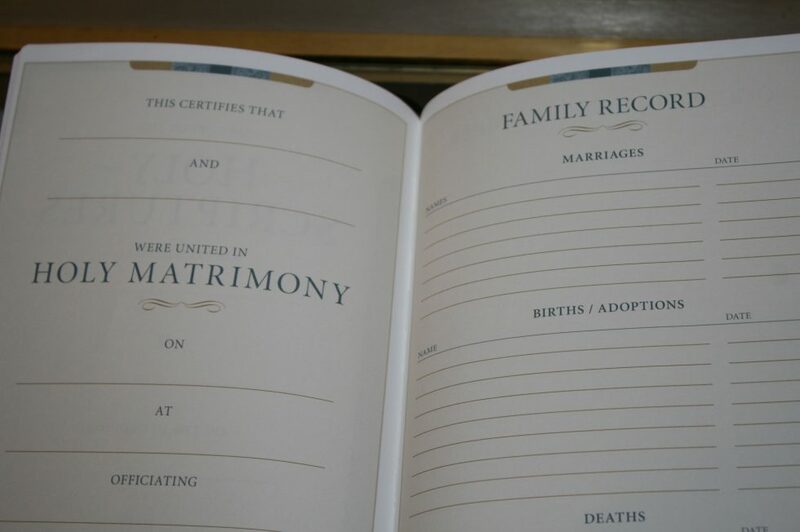 It shows both family and private readings with the dates they are to be read. This plan is found in many Bibles. I like this plan and I’m glad to see it included. We’ve used it to read aloud every night for the past two years. There are four pages of tables that include wet and dry measures, weights, lengths, money, and time. 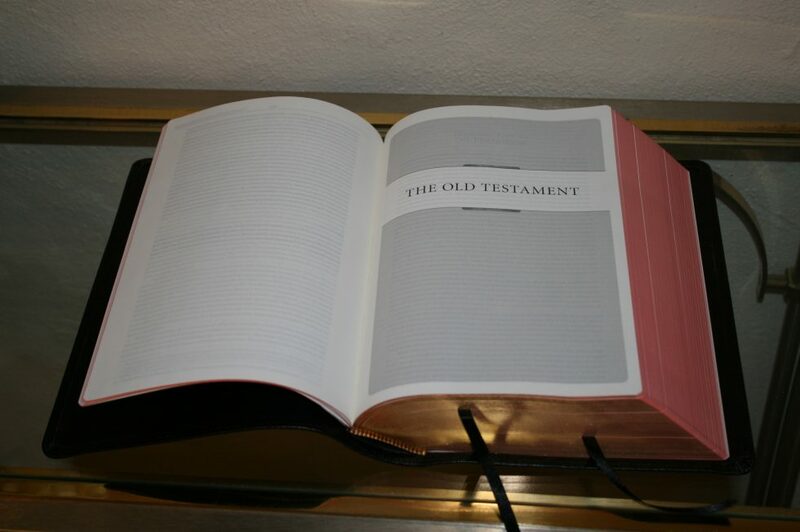 Both testaments are printed separately to show differences. 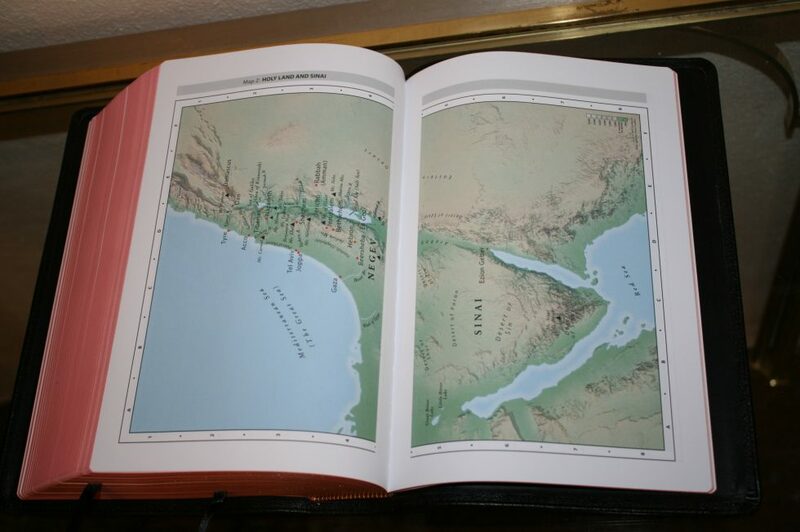 They show the type of measurement, biblical equivalent, imperial measure, metric measure, and biblical references where the measure is used. 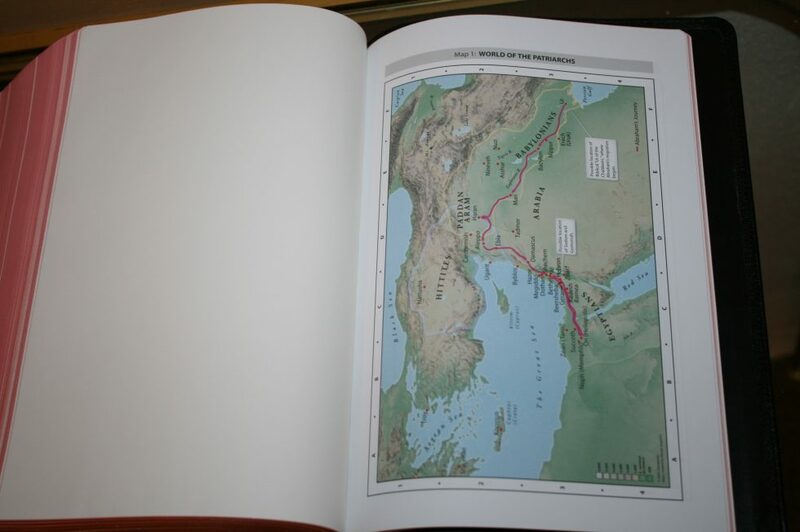 Maps are full-color and printed on thick glossy paper. 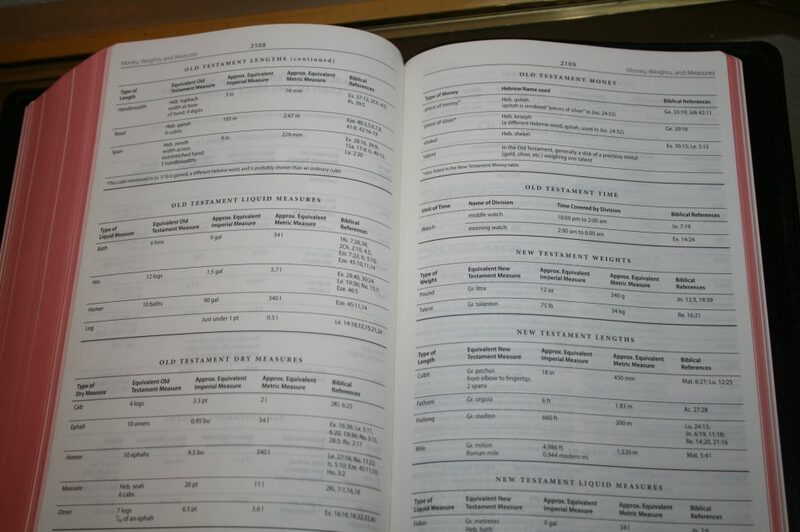 There isn’t an index but they are labeled and annotated well, making it easy to find most things. 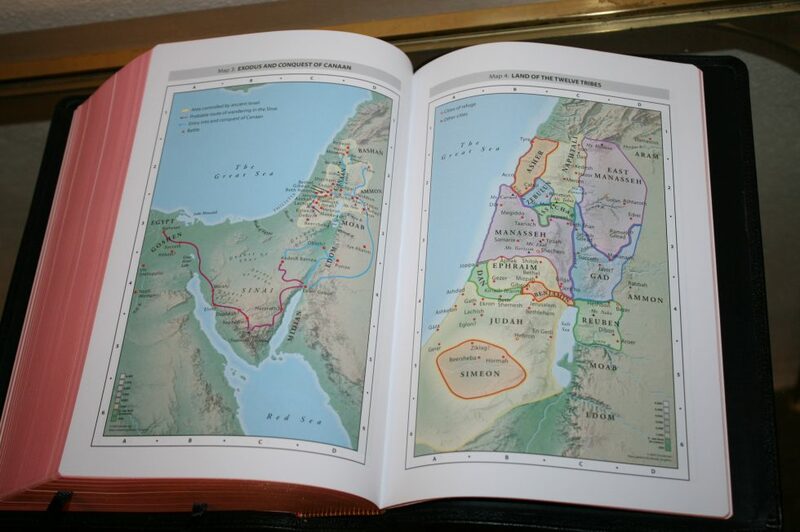 Maps include topography, routes, water, borders, distance, cities, annotations, dates, and Scripture references. 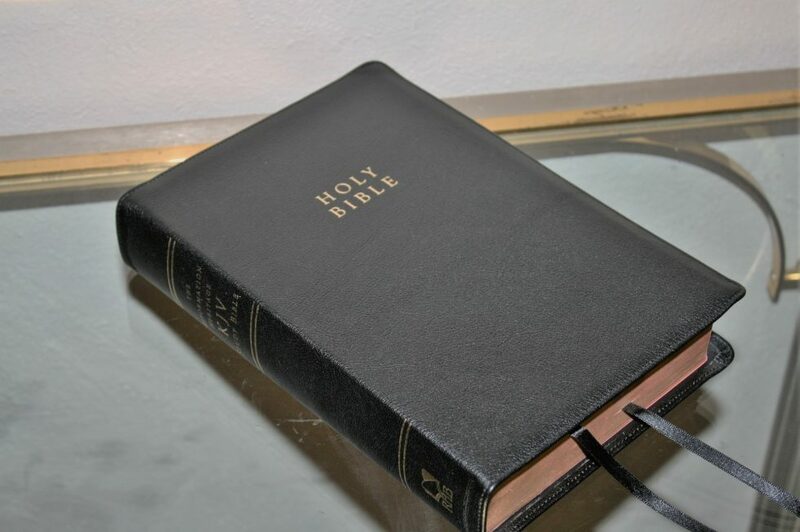 You also get an access code for a free account at holybible.com. 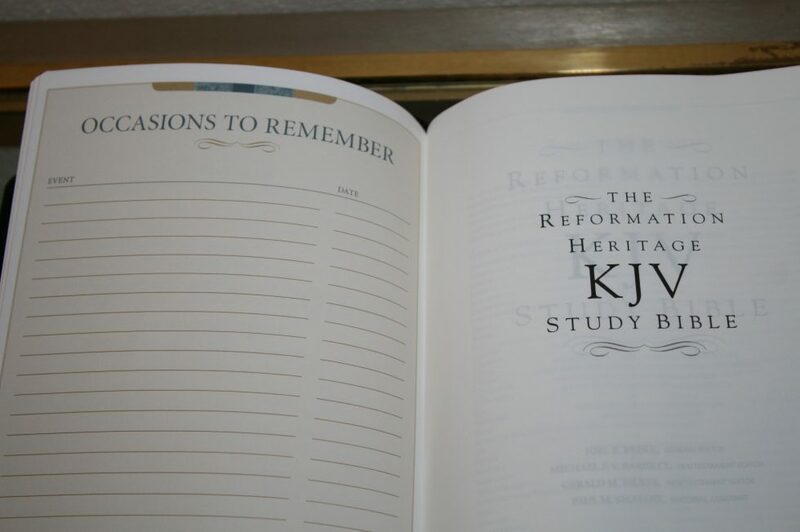 This gives you access to the online version of the Reformation Heritage KJV Study Bible study notes. 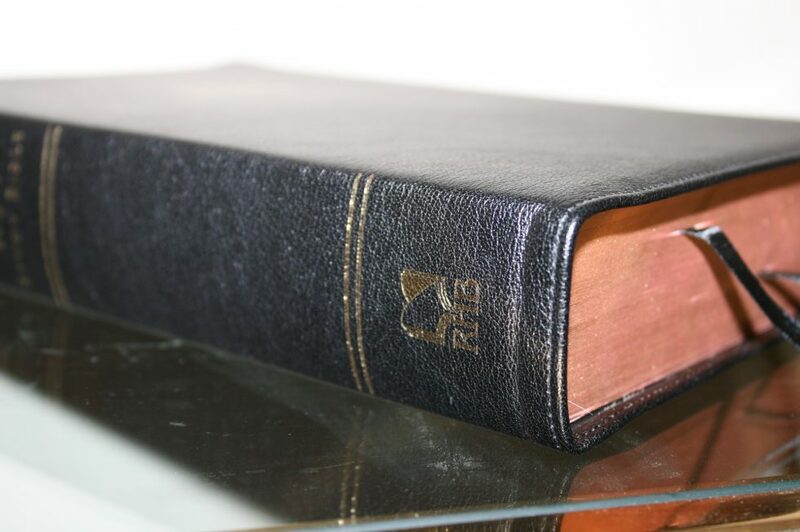 The Reformation Heritage KJV Study Bible in black goatskin is the nicest and highest quality study Bible that I’ve seen. I love the cover, paper, and print. 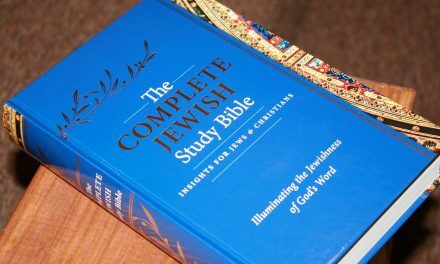 The study material follows reformed theology, so it will not appeal to everyone (and as always I recommend you do your own study). I love the format of the layout. All of the extra material within the text is placed at the bottom of the page and can easily be ignored if you just want to read the text. 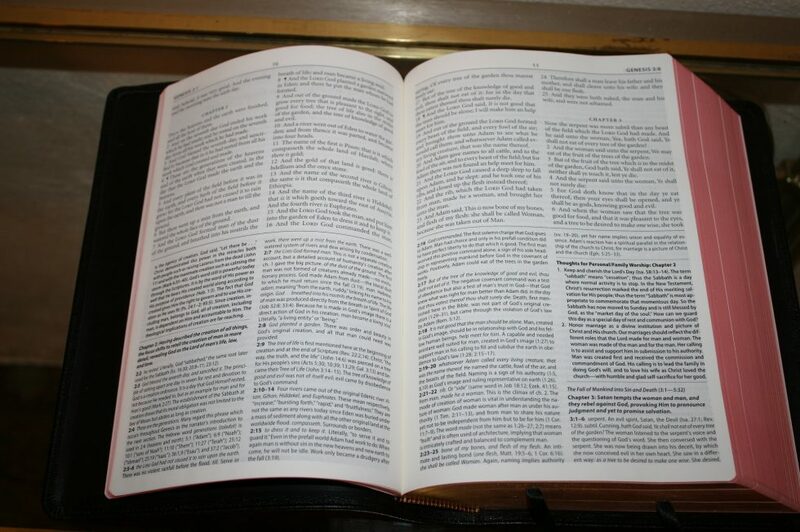 The text is kept clean and free of any distractions. 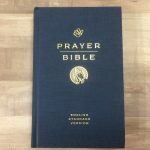 The KJV Reformation Heritage Study Bible sets a standard in study Bible design and construction that I’d like to see others follow. 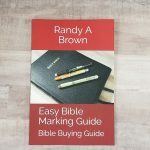 Reformation Heritage Books provided this Bible free for review. I was not required to give a positive review – only an honest review. My opinions are my own. 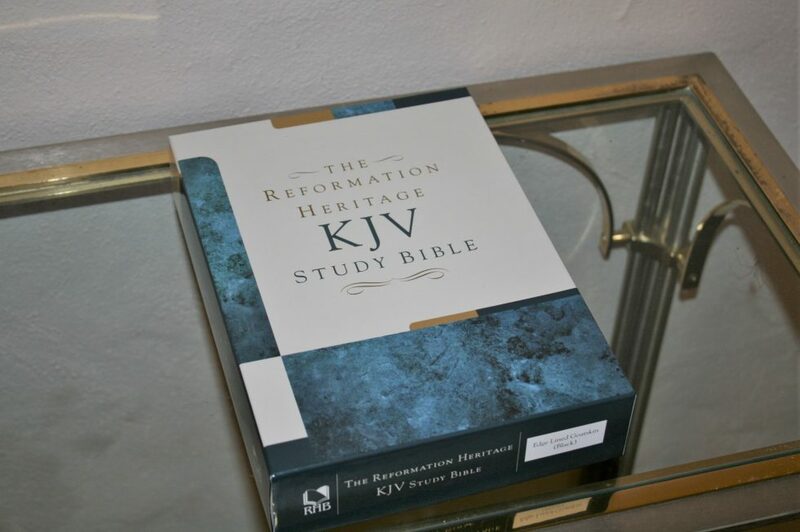 difference between the reformation heritage KJV study bible and nkjv reformaation study bible? which one do you recommend most? Hi Angelo. I haven’t seen the NKJV, so I’m not able to compare them. I’ll be sure to do a comparison if I get one.